Outlook Express Password Recovery Software recover all mail login passwords configured on Microsoft Outlook and Outlook express. 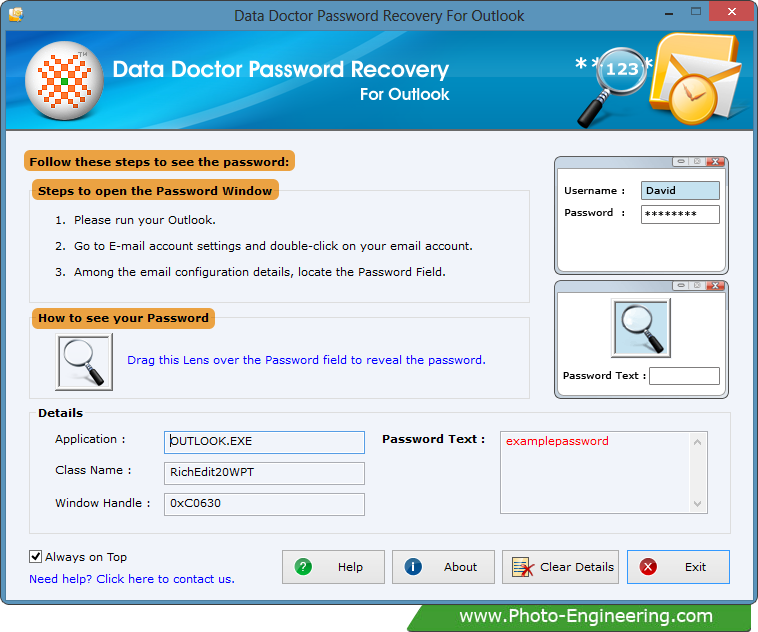 Password recovery software provides full support to multiple user account on all major versions of Outlook and Outlook Express. Password retrieval software provides recovery of lost password even with special characters. It works on Windows 10, Windows 8, Windows 7, Windows Vista, Windows XP and other operating systems. Recover misplaced username and passwords. Lost or forgotten outlook express saved passwords for mail and news account. Recover lost hidden asterisks (****) passwords, Identity passwords. Allow user to browse hidden passwords for all running programs, where password input field is present. Reveals multilingual passwords and even long name passwords. Recovered password information can be easily saved at specified location, so that you can work with it later.